Hi, I am Sajel Bellon Ed.D, CTSS, British by birth and Canadian raised. I am thrilled to join you at The Passion Summit in May 2019. As a Human Connection and Well-Being Prac-Ademic (Practitioner & Academic), I can’t wait to share how YOU can leverage the passion and strengths within yourself, to live everyday with meaning and purpose. 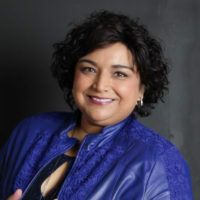 As an Occupational Stress & Trauma Specialist, Edu-preneur and Professional Speaker, I enjoy working with organizations and people, cultivating the space and conditions for enhancing life experiences and relationships (personal & professional), using Positive Psychology, Appreciative Inquiry & Solution-Focused approaches. My message about the importance of human connection and quality conversations has gone global with my TEDx Talk and international speaking engagements. I am known for taking the research off the shelves, making it understandable, through the power of story & humour and practical to use with easy strategies in everyday life. Why not take ‘what works’ and use it to bring out the ‘best’ in us? It’s not about just surviving…it’s all about thriving! Let’s RISE to our passions together in May, 2019. See you there!